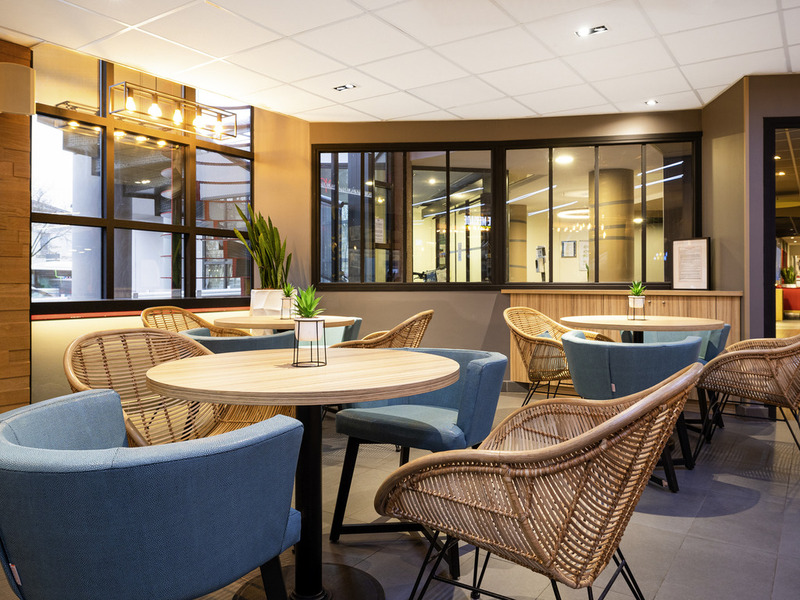 Set in an ideal location, the ibis Bordeaux Centre Meriadeck hotel lets you discover the heart of the city of Bordeaux on foot, with its UNESCO World Heritage listed historical monuments and the Meriadeck business district. Visit the Saint André Cathedral , Place de la Bourse and the wharves of the Garonne River with its water mirror - and be sure not to miss the many shops on Rue Sainte Catherine. #painauchocolat or #chocolatine? Visit our restaurant to discuss it over breakfast! We have everything you could wish for! Very enjoyable. Helpful staff. Excellent lifts. Good dinner and breakfast. We enjoyed our stay as the room was clean and comfortable, the shower had a good spray of water and there was a lift to take us up to near the top of the building. The room was warm but not too hot and we could open the window for fresh air in the morning. The only disappointment was that we could not get any British channels on the TV. The reception staff had good English. We had a room on the 8th floor, I was happy of the height and our room was cosy with a very comfortable bed. On the negative side, the temperature of the room was about 25 degrees Celsius and the air on didn’t seem to make a difference. We had the windows open all day and night but this meant getting bitten by mosquitos coming in to our room. The shower was really nice and our room was refreshed everyday. It would have been nice to have some tea and coffee making facilities in the room, or even a kettle to boil some water. The tv had only two English channels which I felt was very poor for an international hotel. The location is central to everything and we booked well in advance so as to get the best value for money. I would stay here again! Great spot for a short term visit to Bordeaux. Second stay at the Ibis Meriadeck and it was excellent. Nice room, clean hotel, and a great location. With the Tram stop steps from the main entrance, and a bus line just around the corner, this is a great spot to check out the city. Direct bus route from the Airport (35-40 minutes) is also a great benefit. We enjoyed breakfast each morning and were very satisfied with the restaurant and food. Rooms are a bit tight....but they are more than enough for a short term stay (ours was three nights). Staff were all very polite and helped us with questions whenever we asked. Not a huge fan of the small charge to extend a late check out.....but if it helps them keep other costs down then it's not a big deal. I would stay there again if visiting Bordeaux. Room very clean, bed extremely comfortable. Asked for another pillow was on bed when we got back from our walk. Nothing to complain about. Friendly and very helpful check in staff Room adequate but too hot - couldn't get air conditioning to work and would have liked a kettle. Location and price good . Exactly as expected, stayed at this hotel quite a few times now. Very pleasant check in staff and help with keeping documents in hotel safe. Restaurant was very adequate for ease of access at the end of a long day. Second day only half of the buffet was available, no products for lactose intollerance people even lack of bread. Room was fine and restaurant ok. Staff at the reception very kind and helpful people at breakfast unpolite. We were only looking for somewhere comfortable and not too expensive to stay the night and that is what the hotel was. It was cosy and the bed was great. It was a good size room and bathroom too. Booked room as advertised double and single beds. Single bed turned out to be sofabed that when folded out left no room to move in the room. Room to hot - aircon not working properly. Dirt under sofabed - had obviously not been cleaned for months. Toilet roll left ripped on toilet roll holder after last guest had used. Only one towel per guest (all hotels offer 2 per guest). Overall a very basic hotel where the room was not as advertised. Location was good. This is the third time we have stayed here. The beds are comfortable, staff helpful and very friendly. It’s convenient for all of the city’s sites. We ate a couple of times in the restaurant this time and the meals were satisfactory. Location quite central, well priced parking, rooms just a little bit small but clean and tidy with a good television. Breakfast a bit disappointing, they need more coffee machines - service was therefore slow due to the queue for warm drinks.